Free skin care tips. We look at the skin from birth and see what we can do to keep looking as youthful as possible and keep lines and wrinkles at bay. All things – including skin care, nutrition, lifestyle etc is looked at. Good skin care is essential for a youthful looking skin and face, and your "facial skin health" depends on it. You need collagen and elastin for a smooth skin, but you also need adequate moisture and hydration in your skin. Men and women must both take care of their skin to remain young looking, and to ensure the continued health of their skin. A good skin care regimen needs not cost thousands of dollars or take hours every day - but the regimen must be done every day - without fail. We are born with a perfect skin, a smooth complexion - free of wrinkles, marks, scars, blemishes etc with healthy plump fibroblast, collagen and elastin. Should you however disregard the health of your skin care and not follow a good skin care regimen, you will place stress, wear and tear on your skin – and that will result in prematurely aged wrinkly skin. Without proper daily care, your skin will look unhealthy on the whole, with wrinkles forming and the tone of your skin will deteriorate, leading to an uneven and blotchy complexion - and far more chance for the skin to bag and sag. To keep wrinkles and lines in check, you need to look after the health of the fibroblast in the skin as well as the collagen and elastin. With consistent daily care, your skin can fight the ravages of aging and keep wrinkles at bay. Cleaning the skin with a good face wash will remove impurities accumulated during the day, as well as any excess sebum (the natural oil of the skin) excreted. Using a hydrating and nourishing moisturizer during the day will help to keep the dermis and epidermis elastic and moisturized – and thereby minimizing the chances of premature wrinkling and aging. All the factors listed above will help you have a younger looking skin – but remember – you must keep to this every day - that is - not skipping some days if you oversleep and is late, or when coming home late and tired. Good skincare will go a long way to have a younger looking skin and to create that ageless face – but nutrition is also extremely important. To have a smooth and wrinkle-free skin you need to follow a balanced diet, and pay extra attention to food groups and supplements that will help you achieve a better quality skin. A toxic lifestyle – with too much coffee, alcohol, fried foods or too little sleep, relaxation and too little water – will not help to change the odds when fighting wrinkles and lines. As we said - we are all born with a good skin, but with years of neglect and bad habits we kick-start the process of aging and creating an aged skin. One of the major points to keep in mind is to keep out of the sun as most sun damage is generally done before you are 21 years old. Since it is fashionable to be berry-brown during the summer – and tanning salons doing roaring business during winter – it is not always easy for people to keep this advice in mind. Peer pressure is difficult to ignore – but keep in mind that these bronzed bodies of today are going to be the wrinkly, lined, dried-up prunes with blotchy sagging skin and an unhealthy skin tone in a decade. Not only does the sun increase the risk of skin cancers, but it also damages the foundation of the skin, as well as the DNA – which you need to have a good skin. Although aging is a natural occurrence and very few things can stop the sands of time - it has been proven that good skincare can help retard aging and rejuvenate tired looking skin – so it is never to late to mend your ways. Various artificial things like foundation, powder, concealers and makeup are useful, but it can never ever replace or mimic a glowingly healthy looking skin, which exudes vitality. There are many different roads to follow in skin care, and our holding company is involved in various types of skincare products and treatments. 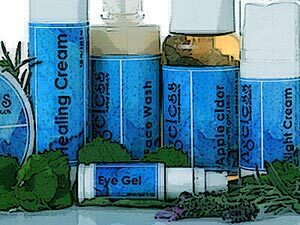 At Ageless we however embrace the miracle and wonder of herbal and botanical materials, and aim to offer the most natural skin care products – but at the same time create products that will effectively fight aging and keep you looking younger for longer. We do not use chemicals and even our preservative was chosen for its gentle action and near nature identical quality and because it is hypoallergenic with no reported side effects. We also do not test our products on animals – and only human volunteers are used for testing, and we follow a ‘fair-trade’ way of doing business. The skin is a wonderful barometer of our health, and although good skincare will go a far way in helping us preserve youth and vitality, we also need to look after the body in general to achieve this anti-ageing look. Have you ever noticed that after a very hectic festive season that your skin seems to be on the decline, or that if you partied a lot, that your skin starts to look a bit wan, washed out and pale? You need to keep in mind that the skin is the largest organ of the body and that when the body is not functionally well, that it will influence the health and appearance of the skin. While wrinkles form easier on dry dehydrated skin, hereditary factors also play a role and add insult to injury. The skin protects the body from injury, infection, dehydration and harmful ultra-violet rays, and consists of two main layers - an outer layer called the epidermis and an inner layer – the dermis. There is a constant action of the tops cells dying off and new cells regenerating in the lower part of the skin. The more nutrients the newly formed cells receive, the more robust and healthy they will be and will help to contribute to a more youthful appearance. A good topical moisturizer that penetrates the skin well is therefore of great use to keep this skin looking younger for longer. For this reason, a healthy lifestyle is essential to maintain your youthful looks. When we refer to a healthy lifestyle we then directly look at minimizing sun exposure, exposure to environmental pollutants, following a healthy diet and taking supplements if required, a good skin care regimen, drinking enough water while limiting the amount of alcohol we consume as well as cutting down on other stimulants such as coffee and also giving up smoking. Junk foods must also be removed from our lifestyle and so also following fad diets, while we should get adequate sleep, have time to relax and also exercising a bit. As we get older the skin gets thinner, less elastic and less robust and skin cells are replaced at a slower rate, while the cohesion of the tissue also starts to fail and skin starts aging and sagging. In a baby the fibroblast is programmed to produce only structural glyco-proteins and mucopolysaccharids. These two building elements give the skin its softness and suppleness allowing for the rapid growth of the baby. Elastin and collagen - which are the tightening agents - are only produced a bit later in this phase, in order to leave the skin supple to accommodate the child’s growth. If these form keeping components are over produced too early, the skin would not be able to “give” enough to accommodate growth and can then result in striae forming. A sharp increase in elastin production occurs from 15 to 25 years of age when the body reaches it full maturity. After thirty the production of elastin decreases and this can be made worse by sun exposure and particularly UVA, which destroys elastin fibers as well as collagen. One should avoid sun exposure to prevent any further damage. Sun exposure must really be limited your entire life to prevent premature ageing. From the age of forty-five the collagen and elastin formation in the skin is far less, and at this time a person would look at using topical or oral agents that would boost the formation of both collagen and elastin, and at protecting the existing collagen and elastin. With age, the skin also takes longer to heal and circulation is also reduced. With a reduction in circulation nutrients are not always effectively taken to the skin cells and cell wastes are not always properly removed from the skin. Collagen – the foundation of a firm skin – is produced less in older skin and it is therefore important to look at any ingredient that will boost the formation of collagen. Elastin – the elastic “form” keeping component of the skin also becomes less elastic and the skin does not return that quickly to its original state – and for this a person would look at ingredients that will promote the heath of the elastin in the skin. During periods of illness – where the immune system is under strain the skin also suffers, and too much stress and anxiety also leaves its mark. At Ageless we also hold the opinion that if you suffer from depression, that your skin will mirror this problem, and your skin not look the best it can. The muscles in our face also tend to become slow, slack and set as we age, and here facial exercises can be of help. We do not sell any facial exercises but give facial exercises away for free. Some people are of the opinion that they do not help, yet we have seen great improvements, and since we have no financial gain from giving these exercises, we really believe in them. When done correctly as described the facial exercises will not cause any lines or wrinkles but you may find that after doing them for a while that you could develop a spot or two. The reason for this is that the skin is starting to move again, and the glands are being stimulated – and the spot will disappear in a couple of days. As mentioned the body needs proper nutrition, hydration and waste removal to host a youthful looking skin. A well balanced diet - not for losing weight but your normal eating pattern – needs to supply sufficient protein, carbohydrates, fats, vitamins and minerals to keep the skin functioning properly. Should your eating or lifestyle habits left much to be desired, then a good detoxification of the system could also boost the health of your skin. Although we at Ageless believe in the benefits of a 3-day fruit detox diet – we also take note of medical people not agreeing with the benefits of a detox diet. As we mentioned above, your diet needs to be addressing all your nutritional needs, but you must also at the same time drink enough water to keep your body hydrated and to assist the waste systems in clearing waste material from your body. If your body is dehydrated, your skin will also be dehydrated, and without enough moisture the skin cannot function properly. Part of this nutritional system also needs to look at the management of wastes in the body. If enough water is present, and there are no problems with the kidneys, your body will be able to get rid of most liquid wastes through your urine, while the lungs will expel the gaseous wastes. The more solid wastes will need to leave your body with regular good bowel movements, and people that struggle with constipation regularly complain of skin eruptions and problems. Should you have a problem with proper bowel movements please read our page on constipation, as we maintain that constipation can negatively affect the way your skin looks. All good skincare regimens begin with proper cleansing. This removes the dirty surface film that the skin picks up from our surroundings, and the more polluted the surroundings, the better the cleansing needs to be. A good thorough cleansing is absolutely necessary for healthy skin. To clean the skin, its best to select a gentle hypoallergenic, pH-balanced cream, lotion or soap, designed to help dissolve surface dirt and any makeup. Massage the cleansing cream, like our Herbal Face Wash well into the skin, wait a few moments and rinse off your face with a lukewarm water. If you use harsh alkaline or acid face washes you may be stripping your skin of the beneficial natural oil of the skin. This is not the case with our Ageless Face Wash – as it gently but thoroughly cleanse the skin without placing any stress on the skin. If you are young you may not need two types of moisturizers – and the same moisturizer can be used during the day and at night. However, when you grow older you may find that you need to look at a more nourishing moisturizer at night. For this reason we produce the Ageless Day Cream and the Ageless Night Cream. Both these moisturizers are applied by placing a small amount on the tips of your fingers, rubbing your fingertips together and then gently smoothing it onto the skin with upward and outward strokes to your face and neck. The skin around your eyes are the thinnest found on the body, and since you have continuous orbital movement of the eyes, coupled to the thin skin, the area around the eyes are very prone to fine lines and wrinkles. Plain rosehip oil is great to combat these fines lines and wrinkles and our Ageless Eye Gel is specially formulated to fight lines and wrinkles as well as dark circles and puffy eyes. When the skin cells are formed they are alive in the bottom-most part of our skin, but as they get older and “mature” they die off, harden and flatten. This is a natural process, but if the dead skin cells do not flake-off properly it leads to a dull, uneven looking skin. The skin therefore can do with a good exfoliation (removing dead skin) at regular intervals to help remove dead skin cells from the surface, in order for your skin to have a radiant look. People should be careful when exfoliating their skin, and it must be done gently and with care, as rough handling can cause micro-wounds and damage the skin. A good exfoliator that is easy to make at home, is to take raw oats and finely grind it (by hand or in a coffee grinder). Add some honey and gently massage this sticky mess all over your skin. The little bit of roughness from the oats will remove the dead skin cells, and the oats and honey will give your skin a radiant glow. Wash the oats and honey from your skin with lukewarm water - although the writer normally washes it off in a shower. Although daily care is necessary to maintain a youthful skin and face, a weekly or monthly face pack can be a great boon to boosting skin health. At Ageless we created a mud face pack, using thermal mud with oligoelements to boost circulation, skin firmness and combined with herbal ingredients to help refine the skin and fight aging. It is important to protect your skin from the environment – be that from the sun or from environmental temperature control. The sun emits dangerous ultra-violet rays, which can cause lasting damage to your skin and can also cause skin cancers with continuous exposure. If you are going to be outside – even if it is cloudy or overcast, use a sunscreen with a minimum of SPF15 and try and limit your time in the sun. With modern convenience we change the temperature of our rooms either up or down to suit our need, and when doing either, we normally also make the air more dry – which then leaches moisture from the skin. If you are using climate control, maybe look into investing in a humidifier – they have become very reasonably priced and your skin will show it gratitude. At times of injury – be that trauma or surgical, like cuts, burns, allergic skin reactions, eczema, psoriasis etc. the skin needs extra care to cope with the demands placed on it. At this time, specialized skin treatment creams and lotions might be needed and here we can offer the very effective Ageless Healing Cream. Our healing cream is made on a base of olive with thirteen added herbal and botanical extracts to help accelerate skin healing while fighting infection, pain, itching and discomfort while at the same time keeping scarring to the minimum by adjusting collagenase. At other times in life – when you are pregnant for instance, the connective tissue in the skin can be under stress – and can be taken to such a level as to cause ruptures – also known as stretch marks or striae. It is however not only pregnancy that can cause these stretch marks, and excessive weight gain, growing too fast or even excessive body building can cause these marks to form. If you have a problem with cellulite, our Cellumend will help you get rid of the already formed cellulite and also prevent new cellulite from forming – but you would also have to look at lifestyle changes to get a permanent solution. An oily skin is very prone to congestion and this often results in spots and blackheads forming. In this instance, hygiene of the skin is of prime importance and proper cleansing plays a major role. After cleansing, toning with witch hazel can be applied before moisturizing to help tone the skin and assist with refining the skin. Although an oily skin must be well cleaned it still needs moisturizing, and a well penetrating moisturizer will keep the skin functioning well. When skin is exposed to too much sun, water or to the effects of climate control, a dry complexion can easily create lines and wrinkles. It is of the utmost importance to keep a dry skin well moisturized and hydrated. After cleansing, toning the skin with rose water can be most soothing and softening. Before applying a moisturizer a drop of jojoba oil can go a long way to create a more supple and elastic skin. Jojoba is a wax ester and not an oil – and will not make the skin oily, but is excellent on a very dry skin. Death and taxes are a given – and aging is also inevitable, but the negative effects can be contained to a large degree by following a good skin care regimen and adopting an anti-aging life-style. Here the skin can also be toned with rose water, and as mentioned previously, a more mature skin can benefit from having a more nourishing night cream. Acne and pimples occurs when the oil producing glands of the skin get blocked and inflamed, which results in skin eruptions - from mild blackheads and pimples to more serious acne and even cysts. Young adults that suffer from problem or acne skin normally have an over-production of the sebum glands as well (linked to hormonal changes) and in this case these young adults would be well advised to keep their skin clean and to apply a non-greasy topical cream like our Ageless Healing Cream. The skin is colonized by millions of bacteria and in general they do no harm, although some less wholesome bacteria can be present on the skin. If these manage to penetrate through a injury in the skin it can cause infections or in some cases an abscess. That is one of the reasons why pimples and spots should not be pinched, scratched or broken. The bacteria can result in the formation of spots and acne and then the sebaceous glands are then infected and enlarged, partly due to the blockage of the follicles in which the glands are situated, they can result in deep cystic acne, which will scar the skin permanently. If the acne however becomes a major problem a dermatologist must be seen immediately and should Accutane (Roaccutane) be prescribed please read our warning page on Accutane / Roaccutane. Skin problems such as eczema, dermatitis and psoriasis cause untold problems to the people suffering from it. Eczema and dermatitis is often caused by allergic body responses and may also be due to allergens causing the problem. Psoriasis is a non-contagious, auto-immune disease and affects millions of people and treatment vary from cortisone and tar creams to PUVA lights and chemotherapy – although no single treatment seems to be totally effective. The skin forms unattractive silvery scales that itch and cause great discomfort. We have helped hundreds of clients over more than a decade to ease the discomfort of psoriasis, eczema and dermatitis with our Ageless Healing Cream. Although it doesn’t cure anything, it does ease the symptoms and bring welcome relief from the discomfort.